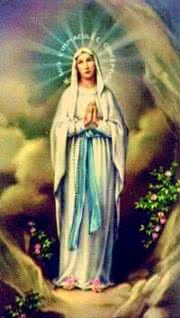 The Litany is one of the many prayers to the Virgin Mary. It is also represented in our collection of Roman Catholic Prayers..
Below is the portion of the Litany which beseeches the Virgin Mary to pray for our sins. into the joy of eternal happiness. Through Christ our Lord. Amen. 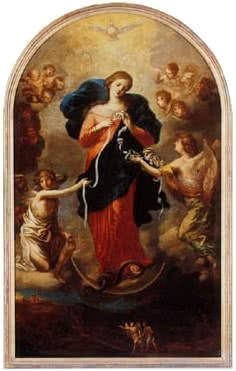 Mary the Untier of Knots, also called Mary the Undoer of Knots is a Baroque image by Johann George Melchior Schmidtner, which dates from around 1700. It may be seen in the Catholic pilgrimage church of “St. Peter am Perlach”, otherwise Perlach church, in Augsburg, Bavaria, Germany. The image shows the Virgin Mary untying knots while stepping on the head of a snake, symbolizing the Devil and also the prophecy in Genesis 3.15 “Thy seed shall bruise the serpent’s head.” As we know, the fruit of Mary’s seed is the savior Jesus Christ, who “bruises” and refutes the Devil with his holy teachings.